feedback, lean processes and reusable components. to provide high quality software design and consulting services with a focus on reusability, modern architectures, delivered using lean processes in close collaboration with the customer. with experts in various areas from Semantic Web and database optimization, to scalable architectures and functional programming. In addition to this we maintain a portfolio of battle-proven high quality open source frameworks. are large international companies like Comptel and QPR, startups like Balancion, public institutions like the National Board of Antiquities and the City of Helsinki, as well as research entities like the The Finnish Literature Society and the Society of Swedish Literature. 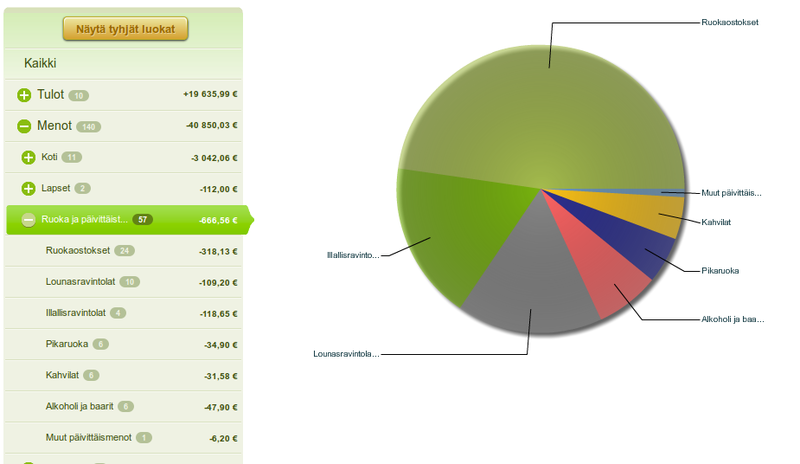 is a web application for managing, planning and following personal finances. It's designed to help people to really see where their money comes and goes. 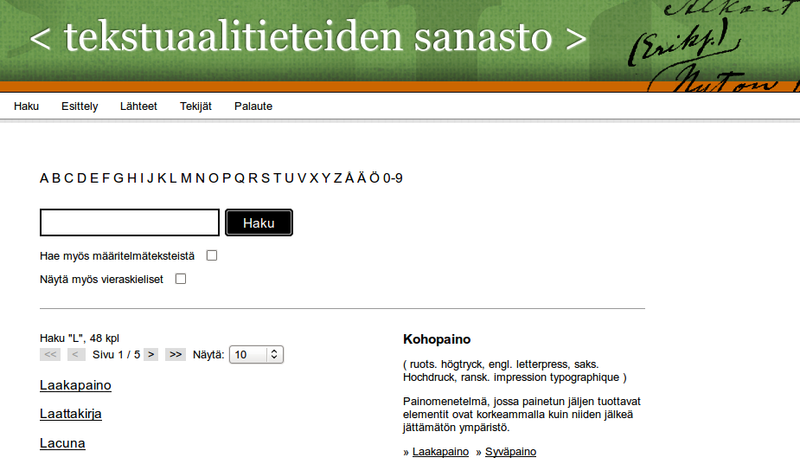 provides access to collections from almost 50 different Finnish museums. is an initiative to create a common source for scattered event information. allows literature reasearchers to annotate XML-documents. It provides version controlled document storage with tools to search, annotate and publish the results. is searchable crosslinked term database. It contains a collection of relevant Finnish terms that textual scholars need in their work. provided a Linked Open Data view of the Aluesarjat statistics. Aluesarjat data includes population, construction and employment statistics of the capital region. 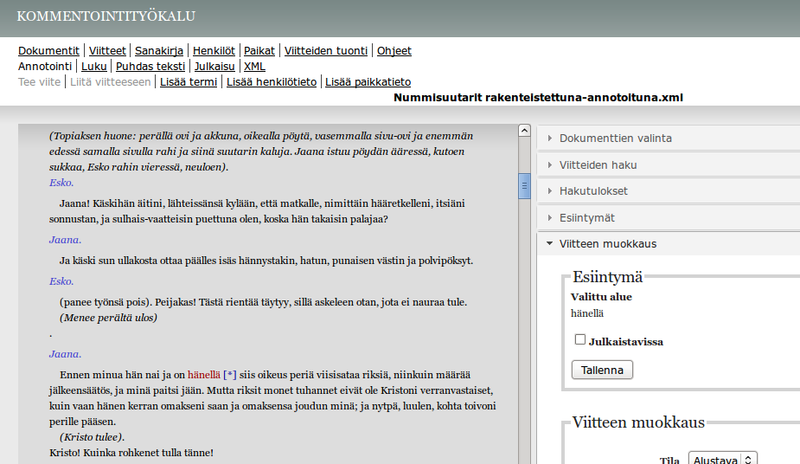 The Finnish Literature Society needed an XML document annotation tool for their researchers. Literature researchers use XML documents in TEI-format that contain the subjects of their research in digital format. No suitable tool was available on the market, so Edith was born. Working on these texts is a collaborative effort where researchers enrich the text with different kinds of information. Like explaining what "verranvastaiset" means in Nummisuutarit, a play by Aleksis Kivi, this play was the first publication for which Edith was used. Mysema worked with the Finnish Literature Society from the very start and built the Edith annotation tool in short iterations. We also participated in the product development of Social Links, which was purchased via the acqusition of Xtract. We wrote a functional demo of the product which was presented at the Mobile World Congress 2012 in Barcelona. After the acquisition of Xtract we participated in the product development of Social Links. Forum Virium develops new digital services in cooperation with companies. Mysema worked with Forum Virium to create Linked Events. It tries to solve a problem where event providers have event data in many different formats and no common way to publish them exist. The idea is to gather and normalize the event data and publish it as open data to all interested parties. 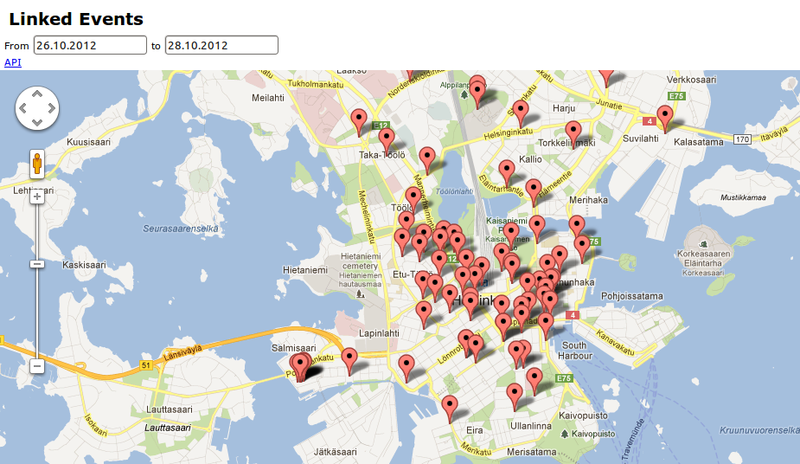 Currently the main source for event and place data is the Helsinki City Tourist & Convention Bureau. The REST API provides data in JSON and JSON-LD, the latter is especially good for users that need the additional semantics. As a part of the Helsinki Region Infoshare effort Mysema created the Semantic.hri.fi application. It provided a Linked Open Data view to the Aluesarjat statistics. Aluesarjat data includes population, construction and employment statistics of the Finnish capital region. Semantic.hri.fi provided a faceted search interface to navigate the statistical data and a Google Maps based interface to display selected statistics and external metadata of town parts. Both of these are built on top of a SPARQL endpoint. 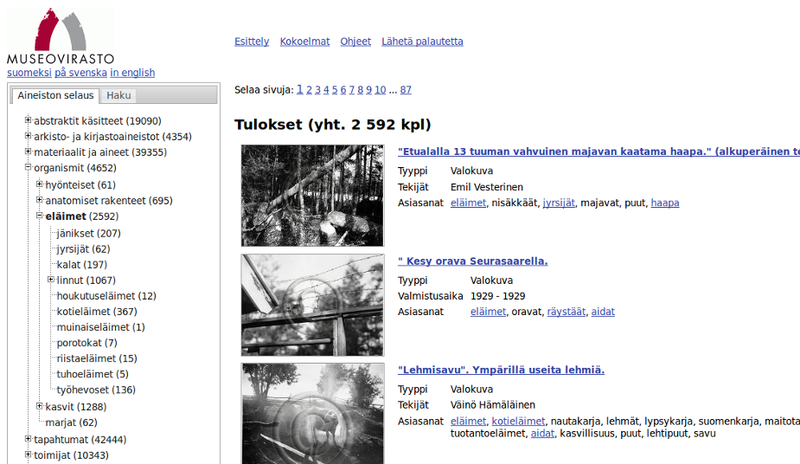 Semantic.hri.fi created linked different data sets through the properties they share, e.g. all statistics of some area and year, and enabled searching over diverse statistical information. The National Board of Antiquities preserves Finland's cultural heritage material by collecting, studying and by distributing knowledge of it. Mysema created Suomen Museot Online, a browsable database of almost 200 thousand items. It gathers data from almost 50 Finnish museums. The data is indexed into Lucene to provide fast access to our national heritage. In addition to the public search interface, Mysema has created an OAI-PMH interface that is used by The National Digital Library to harvest the information into their own system. The National Digital Library has integrated with Europeana, so it is also available there. Balancion is a Finnish start-up that is building a web application for managing personal finances. User's transaction information is retrieved from several different online banks, the information is automatically categorized into relevant categories by a machine learning algorithm. Balancion was on a tight schedule especially because the work had stopped due to the challenges the previous vendor had faced. Mysema professionals revised the software design and thus Balancion was launched on time. The development involved several interesting challenges. First of all because Finnish online banks do not offer public APIs financial data is gathered with complex screen scraping. And second due to the confidentiality of the users' data the development work has very high security and privacy requirements. Mysema participated in an ERP project for a large Finnish customer in the magazine distribution business as a subcontractor of Solita. We participated in the design, implementation and data migration parts of the project. During this project Mysema developed a data migration tool to transfer data from the old system to the new one. Existing related commercial software, such as Oracle Warehouse Builder, weren't flexible enough to adapt to the fast changing schema of the target model. The lightweight and agile ETL-tool enabled cost-effective data migration. As a subcontracter of BDO (formerly known as A-ware) Mysema was responsible to a high degree for the design and implementation of the LibNet service, a web based magazine ordering system. The implementation happened during spring to summer 2006 and after that Mysema took care of the maintenance and change requests until spring 2007. The service integrates all features related to journal subscription handling such as issue search, subscription, arrival tracking, circulation list management, reclamation, subscription renewal, reporting and expense tracking. The end customer was LM Information Delivery which is one of Europe’s leading subscription and information services providers. Their company offers cost-efficient and time-saving solutions in subscription management to over 10,000 customers across Europe. QPR offers business process optimization services and products to its customers. Products include modeling and analysis tools and related consulting. Mysema helped QPR to evaluate the feasibility of using Java for interfacing with SAP ERP systems for data extraction and loading. We designed a method for automated data extraction from multiple external SAP ERP systems. For event producers and marketers, Mysema's event data service is an effective tool for spreading the event information in the web. It helps in posting events into SOME services and publishing the data. When creating events, the tool links relevant content about the concert, e.g. artist interviews and videos, to show for customers. The event data is created according to www.schema.org specs, which allows search engines and other applications identify and utilize the event data. Edith is an XML annotation tool for literature researchers and professionals to annotate documents in TEI format. It provides versioned document storage, document import and export functionality, searchability, annotiation via visual selection, localized user interfaces and support for multiple users. We offer project development services with a focus on Java and HTML5 based technology stacks. We utilize lean methods in our project development and involve the customer actively in the design and development phases of the projects. See the references section for some examples of projects we've done in the past. We have participated in development projects in various roles and have also organized code reviews and custom trainings. We audit projects and whole organisations covering the technology stack, service costs and development/maintenance process issues. Are Continuous Integration (CI) tools used? What are the build triggers? What are the licenses of external components? What are their restrictions? How is testing organized? What is tested and what is the coverage? Which databases are used? How are schema changes handled? "I want to get technology work for people, not the other way around. The way of doing this is to understand the users' needs and the value we can bring with new technologies. I have done jobs from programming, product management, vendor management and sales, it helps me understand how to work with different parties of development projects. " "I'm a programmer with project management experience. Or project manager with programming experience. You can choose! Temporary interests come and go, now it's Clojure and NoSQL, but I will always be interested in creating useful software for real use. Preferably in a good team with great spirit."